Sashaying across the screen like a magnificent wild cat, Marlene Dietrich set the benchmark for bawdiness with her breakthrough role as Lola Lola in The Blue Angel. We don’t see her until well into the film but when we do she leaves an indelible impression. Totally comfortable in her crinoline centre stage at the eponymous German night club, the voluptuous showgirl turns her back on the audience to reveal a fantastic pair of stockinged legs and a frilly pair of knickers. Back stage she’s just at ease removing various items of clothing and adjusting the elastic around her upper thighs – gestures that drive any male who happens to stumble into her dressing room wild with desire. Like Lulu in Pandora’s Box, men loose their senses in her presence but what can she do? 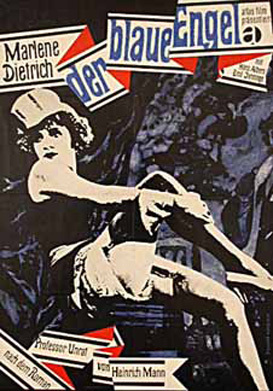 Sitting on a barrel in her sequined top hat she croons her signature song; ‘Falling in Love Again’ in the English version and ‘Ich bin von Kopf bis Fuss auf Liebe eingestellt’ in the German one. The two separate films were shot simultaneously to accommodate European and American markets and both are available in this Directors Suite edition. But whichever language you choose, the story is still the same. The uptight Professor Immanuel Rath (Emil Jannings) is smitten to the core upon hearing Lola Lola sing. Despite her warning lyric; Men cluster to me like moths around a flame. And if their wings burn I know I’m not to blame, Rath leaves his job at the local college, marries her and goes on the road with her troupe. Lower and lower he sinks until his final humiliation comes performing as a clown back in front of his home town audience. It’s a tragic tale of demise but it still shines like a beacon thanks to the luminous performance of Ms Dietrich.